- We will meet to paint at the Silverthorne Library between 9 am - 1 pm on select Mondays this winter. No need to register; just show up ready to get your brushes wet! Tables and chairs are available for set up at both locations. Please stow everything away once you are done. We follow a similar format to our summer Paint-Outs. Start around 9am, break for lunch around noon and follow with a critique. You can bring reference photos, paintings you have started or whatever else you want to work on. 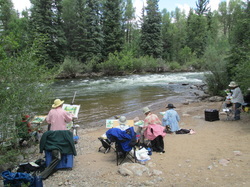 ​Paint-outs are Tuesdays 9am – 1:15 pm; lunch break @ 12:15 with half-hour critique at 12:45. Anyone wanting to stay and paint after 1:15 is welcome to do so. A reminder of each week’s paint-out location with directions will be emailed a few days before. ​Car-pooling: If you want to carpool, SEND AN EMAIL to WOWers BY NOON MONDAY expressing your interest in carpooling, so you can determine interest of others, & meeting place. Car-pooling Meeting places: Frisco, Safeway parking lot– east side closest to Baymont Inn and Summit Blvd; and Breckenridge, City Market parking lot, west end of lot farthest from store. Silverthorne/Dillon, Office Max parking lot. BE THERE BY 8:15 AM…departure at 8:30! 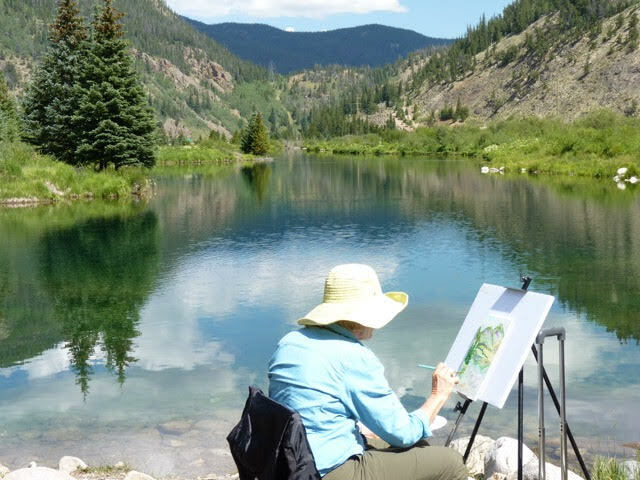 Artist Jamie Alexander painting near Copper Mountain summer 2018.